So what are cannabinoids anyway? Scientists have identified close to 500 phytochemicals in Hemp plants. Many of them, hundreds in fact, are Terpenoids. These are the compounds that give fruits, flowers and herbs many of their desirable aromas, flavours and other special properties. A special sub-class of Terpenoids are the Cannabinoids. There are over 60 of them found in Hemp / Cannabis Sativa which is the only place they are found. This is one of the many reasons Hemp stands alone in the plant kingdom. It literally is a treasure chest of nutrition without equal. Hundreds of abstracts published on the results of cannabis research can’t be wrong. The links to 567 of them posted on GreenMedInfo.com, give viewers the opportunity to click their way to research that demonstrates the wide range of healing attributes and therapeutic properties of Cannabis sativa. The Cannabinoids each have their own individual properties which is creating plenty of excitement in the scientific community. Besides the Terpenoids and Cannabinoids there are many other vitamins, minerals, phytosterols, pigments, proteins, enzymes, essential sugars, polyphenol antioxidants, flavonoids and essential fatty acids. The oil appears black but it is really a blend of intense colors. It is important to know that while isolated Cannabinoids have their own characteristic properties, the different compounds have synergistic effects when the whole symphony of phytonutrients are consumed together. Synergy means that the combined effect is greater than the sum of the individual parts. Another way of thinking of this is 1+1. You know 1+1=2. When Hemp phytonutrients are consumed together, as they naturally occur in the plant, then it is as if 1+1 now equals 3 or 4 more! The unique health properties of Hemp have been known to modern science for over 50 years, so naturally, attempts were made to produce synthetic versions of isolated Cannabinoid molecules in an attempt to create pharmaceutical drugs. Unsurprisingly, as with all synthetic chemicals, the desired properties are often reduced significantly while undesirable side-effects can abound as is confirmed in the United States Government Patent #6,630,507 "Cannabinoids as Antioxidants & Neuroprotectants." 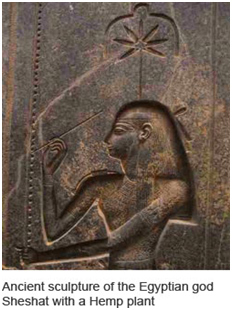 Every major civilization in history has recorded Hemp as #1 on its list of important plants. The ancient Chinese, Indians, Egyptians, Assyrians, Persians, Greeks and Romans all revered it as an incomparable source of food and medicine. In addition to the long list of properties that Hemp's Cannabinoids possess, modern science has discovered what may be the most exciting one. We are hard-wired with a system of Cannabinoid receptors throughout our brain and body. When these receptors are activated they permit 2-way communication between body systems, something that the science books had previously taught was impossible. This system is called the Endocannabinoid System (ECS) which literally means "the Cannabinoid system inside the body". By regularly supplying our ECS with the nutrients it was designed for, vital communications can be restored between the control centers of the body and every other system. Due to the persecution of Hemp and Cannabis in the last 80 years, most humans living today have gone their entire lives without feeding their bodies these raw materials. you might imagine it like a large orchestra being made to play blind-folded. They can't see the conductor and they can't read the music. Sometimes they get it right but most of the time it's a mess. Bringing the body back into harmony could be as simple as replacing this lost nutrition. 4000 Year Old Endocannabioid System - There is one place in the body where there are no Cannabinoid receptors - the brain stem. The brain stem is the control center for the heart and breathing. What this means is that it is not possible for Cannabinoids to overwhelm those systems and cause them to shut down. This is why, in 4000 years no one has ever died from consuming Hemp Oil. 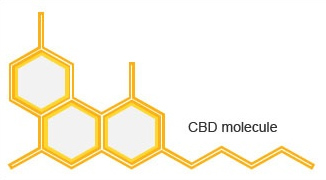 CBD is short for Cannabidiol which by all scientific accounts appears to be the ROCKSTAR of the Cannabinoid world. It is the most predominant Cannabinoid in Hemp and is endowed with many beneficial properties. "Cannabinoids are potent antioxidents...they easily penetrate tissues giving them the ability to enter the central nervous system and brain." "Non-psychoactive Cannabinoids such as CBD are particularly advantageous as they are non-toxic...and exhibit unique antioxidant properties without the undesirable effects of THC." "The antioxidant strength of CBD is significantly greater than that of either Vitamin C or Vitamin E."
Safety and CBD Oil - Hemp CBD Oil is safe for the whole family. CBD when properly extracted and not blended with potency reducing oils and fillers can help reduce pain and may play a preventative and supporting role in treating many maladies. Sunshine Global Services LLC. All rights reserved.